Was Israel Behind Iran Explosion? A massive explosion at a missile base near the Iranian capital of Tehran on Saturday that killed 17 Revolutionary Guards was speculated by some to have been the work of Israel. The base is said to be a storage center for some of Iran's advanced Shahab 3 ballistic missiles, which can hit Israel. Among those killed in the blast was one of the heads of the Revolutionary Guards. Iranian media said the explosion was the result of a work accident that occurred when certain munitions were being moved around. 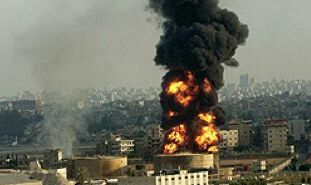 But it was impossible to ignore the fact that the incident came just days after Israel had so publicly debated whether or not to launch a preemptive strike against Iran's nuclear and long-range missile facilities. Adding to suspicions was an Iranian journalist who told the local Mehr news agency that despite the large number of casualties, only six hand-picked paramedics had been permitted to enter the facility. On Sunday a Palestinian businessman who had recently returned from Iran told Voice of Israel that Iranians with dual citizenship are fleeing the country. The Palestinian man said most Iranians believe Israel will soon launch a devastating attack against their country that will lead to an even more devastating regional war, and they are looking to get out while they can. Last week the International Atomic Energy Agency (IAEA) published a report that confirmed Iran was designing nuclear weapons, and could field as many as four warheads in the very near future. The report sparked heated debate in Israel over whether or not to launch a preemptive strike, as Israel did against Iraq's nuclear reactor in 1981 and a Syrian nuclear facility in 2007. A poll commissioned by the Anti-Defamation League last week found that 57 percent of Americans support an Israeli strike on Iran.